It's time for our Big Reveal! 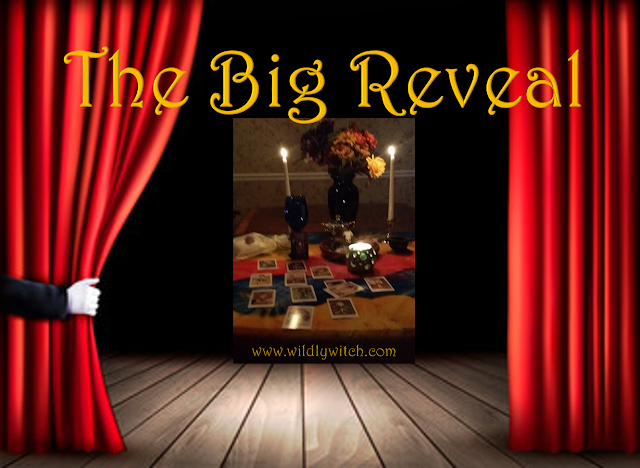 If you haven't done so, please go to the Wildly, Witch Facebook Page and select your card. For those who have, let's get to it. This deck, as mentioned on the page, is The Vanessa Tarot by Lynyrd Narciso. "With humor, glamour and an attitude of adventure, this delightful deck invites readers on a joyrider through the Tarot. 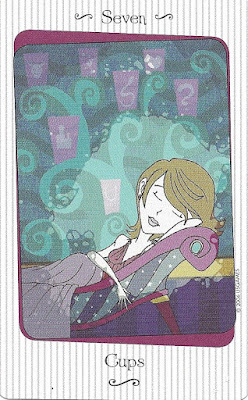 Taking their inspiration from pop culture, the sassy but sage characters of this deck playfully reinterpret traditional female roles as they share all their special secrets. Packaged in a tin." The Eight of Swords can represent feeling trapped, confined, restricted or backed into a corner or having your hands tied. It signifies fear, terror, anxiety and psychological issues. It is a Minor Arcana card of hopelessness, helplessness, powerlessness, slavery, persecution and being silenced, or censored. You will be feeling the pressure when this appears and may be in crisis or going through a dilemma or drama. However, the overall theme of this card is that you are the one keeping yourself in this situation through negative thinking, and allowing yourself to be paralyzed by fear. The swords depicted in the card are surrounding you but you can take the open your eyes, and walk away at any time! This is a card that is confronting you with the stagnant aspects of your current situation. 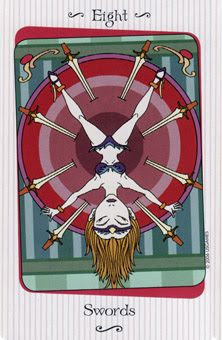 Often, Tarot readers will tell a person receiving this card during a reading that the Eight of Swords in the present position represents denial. Oftentimes, the querent will then deny that there is any of that behavior going on. The Eight of Swords in the Present position lets you know that you may not be the person who put the blindfold around your eyes, but you are the person keeping it on. Open your eyes, and walk toward a place of confidence. This often suggests someone with anxiety, who hasn't learned coping mechanisms. Seek professional help, if you are feeling this way. Key words: Feeling trapped, restricted, backed into a corner, hands tied, victimized, paralyzed by fear/terror, anxiety, feeling pressure, hopeless, helpless , powerless, silenced, crisis, dilemma, drama, imprisonment, punishment, slavery, persecution, judgement, trial by jury, consequences, negative attitudes, psychological issues, major weight-loss. The King of Wands indicates that you will have the energy, experience, and enthusiasm to accomplish what you set out to achieve, at this time. You are taking control of your life. You will motivate those around you, lead the way forward, and set a good example for those who look up to you. 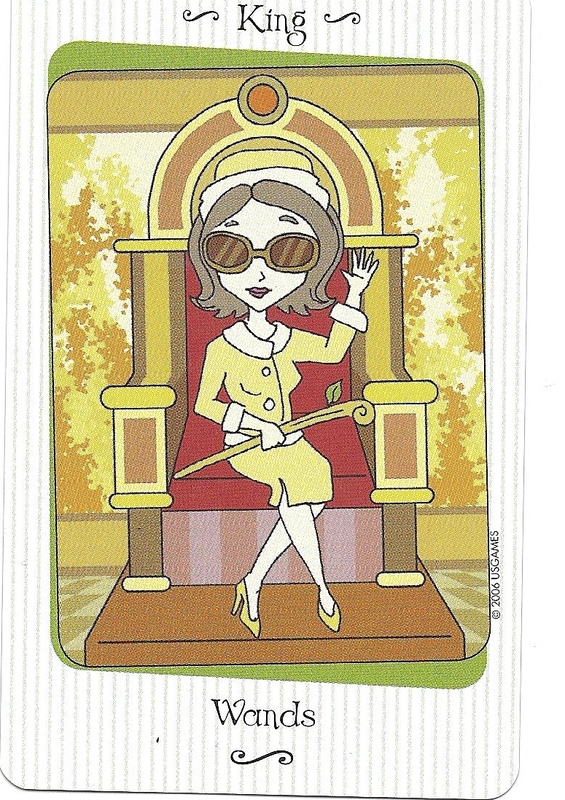 You do not worry about other people’s opinion of you and you dare to be different when this Minor Arcana card appears in your Tarot reading. As a person, the King of Wands is a mature male who is confident, strong, energetic and optimistic and a natural born leader. He may be a fire sign such as Aries, Leo, or Sagittarius He is friendly by nature, funny, charming, and good with words. He is also fearless, freethinking, motivated, and action-orientated. He has an independent streak, and as such, he needs his freedom, and will not tolerate neediness. The King of Wands does not like to let emotions stand in the way of his enjoyment of life. He is usually supportive of those around him and has learned to be lenient. 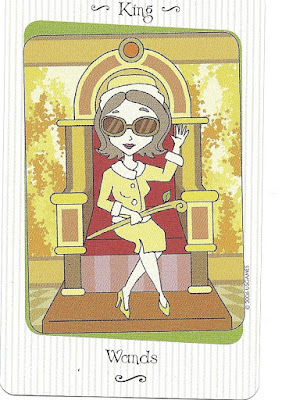 However, the King of Wands can be self-centered, hot-tempered and controlling. He is at his best when he is allowed his freedom, and is proud, passionate, honest, loyal, dependable, and protective. The King of Wands, in the present position, indicates that any project you are working on is an inspired choice, and will take you far. There is no time like the present to use your abilities to solve a complex problem. You can get many people to help you as long as you keep them inspired and ensure that the aim of your project has some benefit to them as well. Your ability to delegate is strong, and this is an indication of a new level of maturity – you can trust other people instead of trying to do everything yourself. This is a high-water mark in your development on the path to success. Key words: Energetic, experience, optimistic, confident, strong, friendly, funny, charming, way with words, fearless, freethinking, motivated, action-orientated, proud, passionate, honest, loyal, lenient, dependable, protective, natural born leader, self-centered, controlling, hot tempered, taking control, daring to be different. The Nine of Swords is another of the fear and anxiety cards in the Suit of Swords. Similar to the other fear cards, this card is not an indication of negative events actually happening, just that your fear and anxiety levels are so high they are making you feel that things are worse than they are. In short, you may be making mountains out of molehills. It represents stress, burdens, negative thinking and deep unhappiness. You will be feeling overwhelmed and unable to cope with or face situations, problems or just life in general and may have reached your breaking point. It is a Minor Arcana card of mental anguish, remorse, guilt, regret, joylessness and despair and you may wish you could go back in time and re-write the past when it appears. It can also signify feeling isolated and being the subject of gossip and it can represent nightmares and insomnia. This may refer to someone going through menopause, or hormonal changes, of some kind. Reach out to those you love, and seek professional assistance, if necessary. Be your own best friend, right now. It's time to heal, and you are not alone. Key words: Fear, anxiety, terror, negativity, deep unhappiness, stress, burden, overwhelmed, at breaking point, inability to cope or face life, mental anguish, guilt, regret, remorse, focusing on past, subject of gossip, isolation, making mountains out of molehills, joylessness, despair, nightmares, insomnia, hormonal, menopause, migraines. 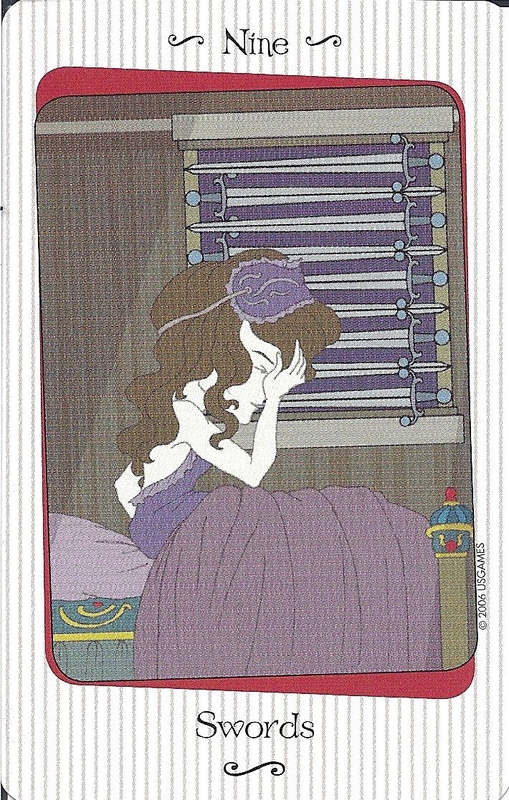 The Seven of Cups Tarot card represents having lots of options to choose from or multiple possibilities open to you. It can be an indication that you have so many choices or so many things going on at once that you may be overwhelmed or unable to focus properly. You need to limit the amount of things you are taking on to a manageable amount. There is no point in agreeing to do things if you can’t give them the time and attention they deserve. Try to be realistic about what you can commit to. The Seven of Cups can also signify that you may be indulging in wishful thinking, fantasies, or living in a dream world. When this Minor Arcana card appears in a Tarot reading, it indicates that you need to make a decision in your life, and realistically look at where you are. Take proactive steps to make your situation better, rather than fantasizing about how you want it to be. Your imagination is a great tool to help you envision your future but it will never happen, unless you take action to make it so. 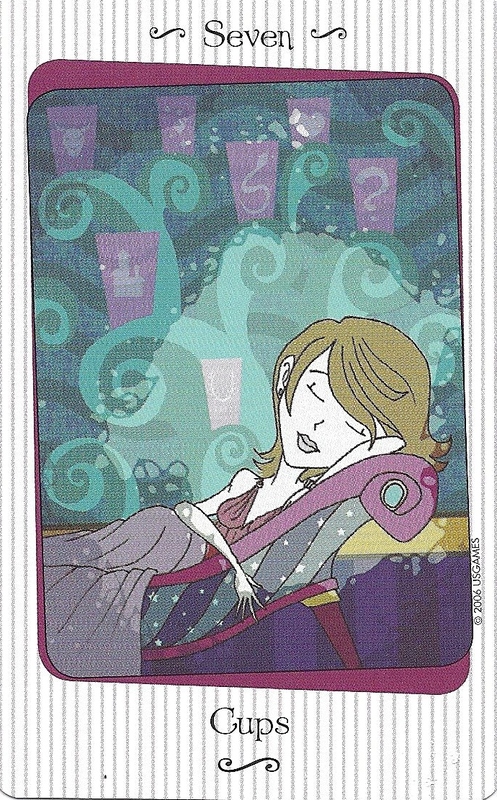 In the present position, this card indicates that you are being sidetracked by desire, instead of staying the course in a healthy relationship, or steady project.What looks fun and tempting, is almost never as enjoyable, and yet the cost is often higher in personal suffering than we ever imagined. Choose wisely. Choose YOUR best interests for the future. Key words: Lots of options, choices, multiple possibilities, opportunities, picking and choosing, decisions, procrastination, dreaming, fantasy, illusion, wishful thinking, imagination, hallucinations, meditation. How did you do? Come, join us on the Wildly, Witch Facebook Page, and let me know how I can best support you!